Sub: Reimbursement of medical expenses claimed by serving and retired Railway employees - simplification of procedure-requested. (ii) NFIR’s letter No. 1/12/Part V dated 09/05/2016, 17/04/2017 & 10/07/2017. (iii) Railway Board’s letter No. 2005/H/6-4/Policy-I dated 01/06/2017. Federation desires to invite kind attention of the Railway Board to NFIR’s PNM agenda Item No. 41/2016 relating to the simplification of procedure for reimbursement of medical expenses claimed by the serving and retired Railway employees. The subject matter was discussed in the NFIR’s PNM meeting held with the Railway Board on 22/23-12-2016 when the Official Side explained that a simplified procedure is being drafted and it Will be finalized shortly in consultation with the Federation. Federation is surprised to note that while no further consultation with the Federation has taken place the Railway Board vide letter dated 01/06/2017 quietly issued revised reimbursement claim form with Correction Slip to Annexure-III of Para 648 of IRMM 2000, without citing the NFIR’s agenda item No. 41/2016. This action has disappointed the Federation whose track record has been “strengthening IR and improving efficiency levels”. 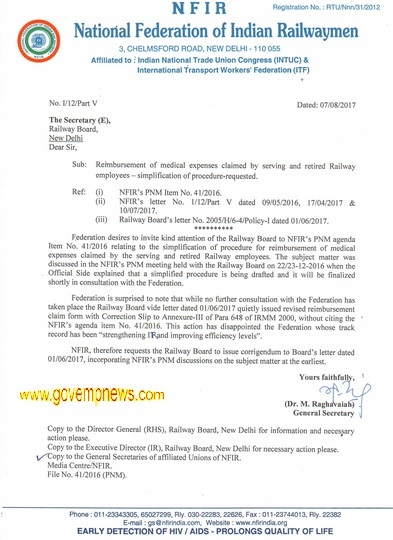 NFIR, therefore requests the Railway Board to issue corrigendum to Board’s letter dated 01/06/2017, incorporating NFIR’s PNM discussions on the subject matter at the earliest. Copy to the Director General (RHS), Railway Board, New Delhi for information and necessary action please. Copy to the Executive Director (IR), Railway Board, New Delhi for necessary action please.